So, if you have visited these Mayan sites and left disappointed, there is a solution right at home. The Canadian Museum of Civilization has just opened an exhibition titled Maya: Secrets of Their Ancient World. Frankly, your will see more artifacts up close at the museum than you will encounter at the actual archeological sites, although Civilization can not boast a steep pyramid to climb, a ball court to test your athleticism, or “genuine” Mayan souvenirs made in China. The Mayan exhibition arrived in Gatineau after a successful run at the Royal Ontario Museum in Toronto. There are many splendid sculptures, friezes, ceramics, jade jewellery, bone carvings, and other artifacts. Note that the heads of people portrayed in many of the sculptures are cone-shaped. That’s because the soft skulls of Mayan babies were intentionally shaped this way by being squeezed between two boards for long periods of time. Faces were often decorated with intricate patterns of scars. People, it seems, have been slaves to fashion since time immemorial. A favourite artifact in the exhibition is titled “Tablet of the Warriors From Temple XVII.” Carved from stone, it comes from Palanque, well in the interior of the Yucatan peninsula. Almost life-sized, it depicts a ruler of Palanque called K’inich Kan B’alam II towering over a kneeling enemy captive. Such captives were tortured, humiliated, and killed. The fun was just about to begin in this scene. We see this ruler again. Well, at least archaeologists think it is the same man in a clay sculpture of a head, simply entitled “Head of man with a headdress.” He’s not quite so fearsome in this work. Another gem, this one tiny enough to fit in the palm of your hand, is called “Figure of a death god decapitating a captive.” It needs no further explanation except to say the death god is quite terrifying and the captive’s head is grimacing as it falls from the shoulders. Yes, the Mayan were cruel at times. But what civilization was not cruel 1,500 years ago? The Mayans were also smart. They even did brain surgery of a sort. And they were astronomers. Some interpretations of Mayan legends say the world will end Dec. 21 this year. So party hard for the next few months. It might be your last chance. 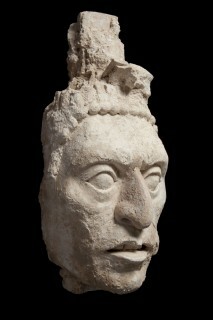 Maya: Secrets of Their Ancient World opens May 18 at the Canadian Museum of Civilization and continues until Oct. 28. For information visit www.civilization.ca.